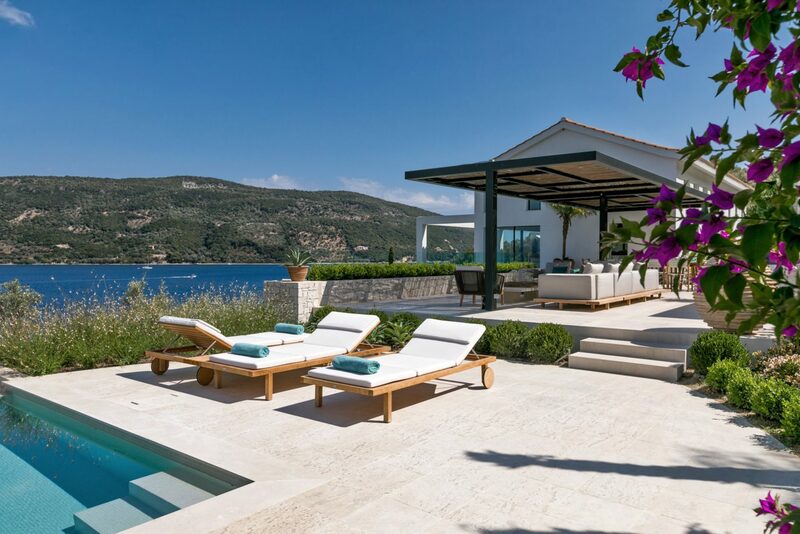 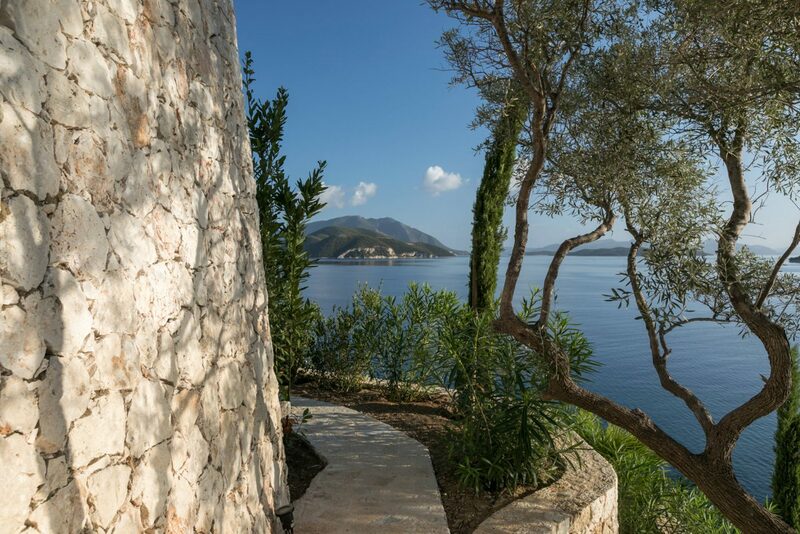 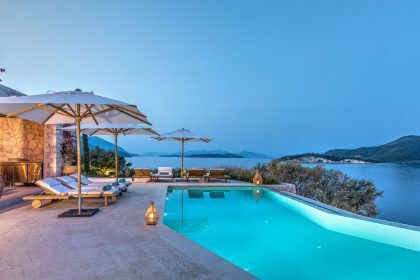 The villa is in the south east of the Ionian island of Lefkada and is situated half way down the Eastern side of the Lefkada channel. From the house you can see Meganissi, Thilia, Scorpios and Lefkada and there are views beyond to mainland Greece. The west coast of Lefkada boasts long, sandy beaches and the vibe on the island is generally very laid back, all about the outdoors and having fun. 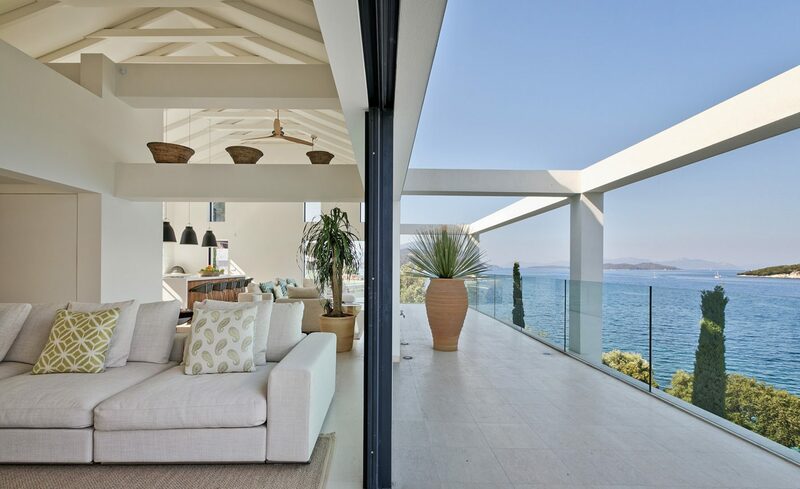 There is so much to see and so much to do. 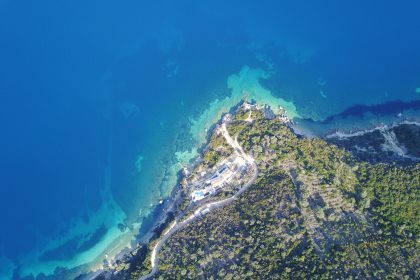 Sivota is well suited for boating. 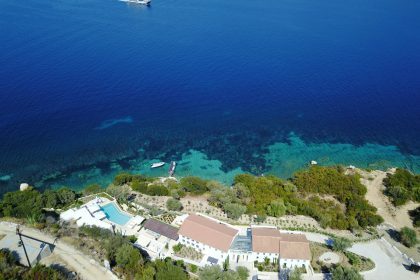 It has a wonderful small marina, great shops and a good choice of tavernas. 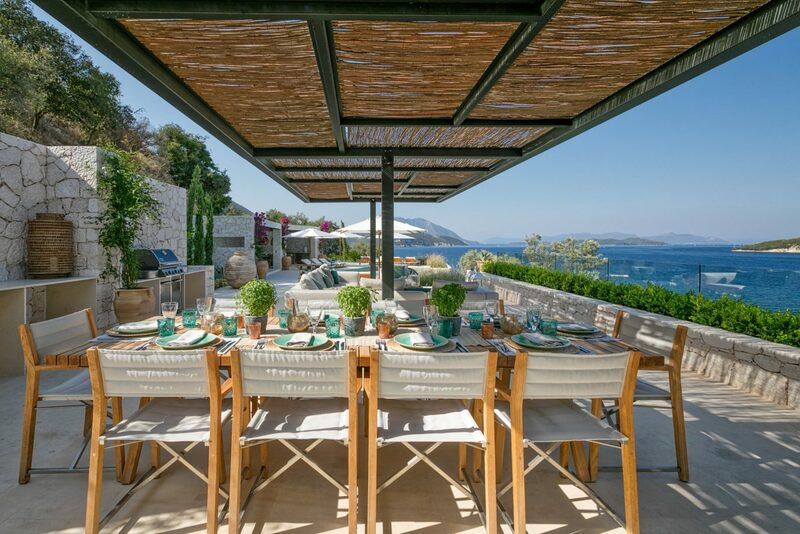 Hire a boat nearby and chug out to the delightful island of Meganissi, here eat in one of the fabulous fish tavernas, spend the day diving in the turquoise water before heading home to enjoy a drink on the terrace. 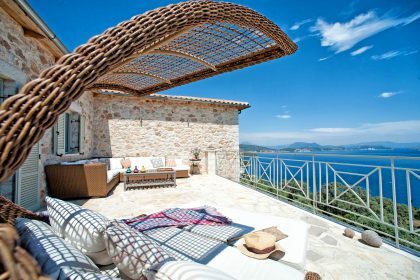 You can take a little path from the house up round the hills above and enjoy the amazing views of Lefkada, Meganissi and eventually south towards Ithaca and Kefalonia. 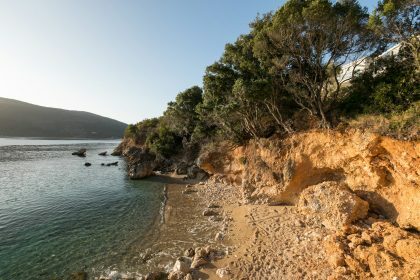 There are waterfalls, paths to hike and with a coastline of 117 kilometres this is the island to come to for variety, watersports and having fun. 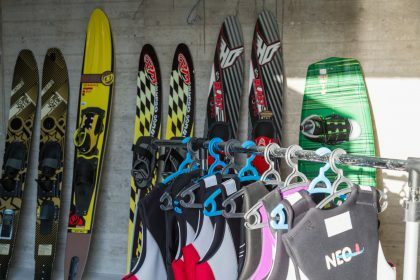 There’s literally everything from diving, windsurfing (for which the island is very well known), kitesurfing and sailing as well as waterskiing, canoeing and just pottering around in small boats. 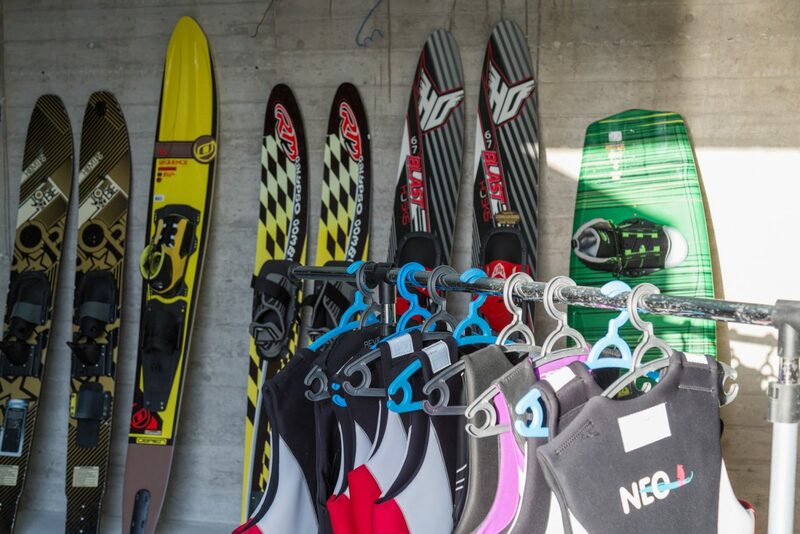 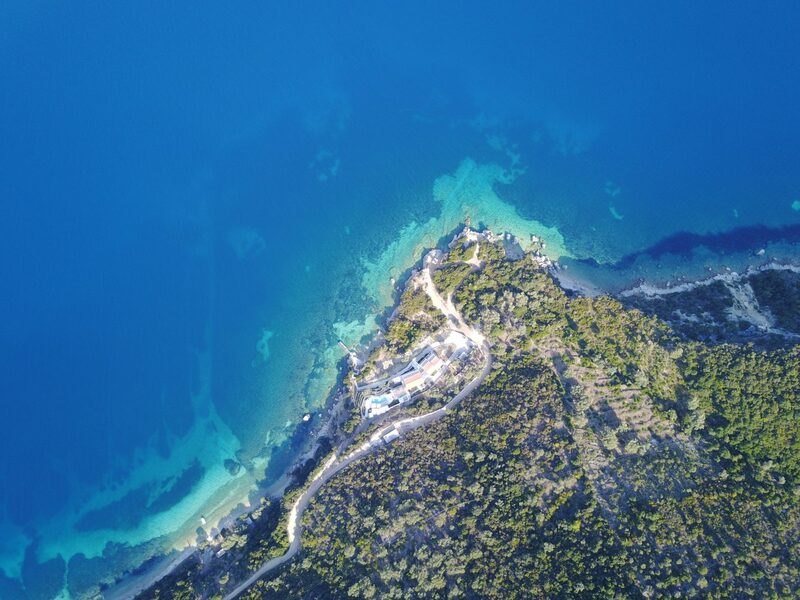 Agios Ioannis is very well known for windsurfing and there are many competitions here which surfers travel to from all over the globe. There are ancient Greek Orthodox churches to visit, tiny mountain villages to explore, many coves to swim in from your boat as well as hundreds of great restaurants and bars to enjoy. 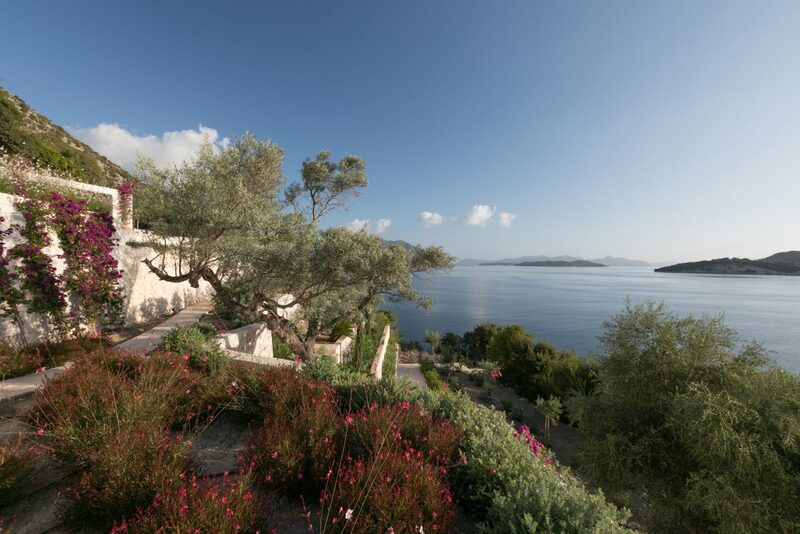 You certainly won’t suffer from island fever when here, there’s far too much to do. 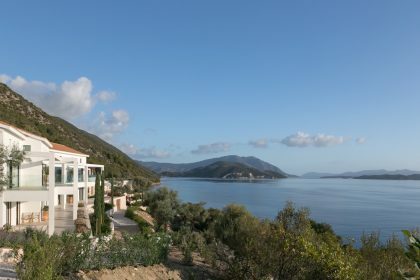 Local to Lefkada are Kefalonia, Ithaca and Kastos. 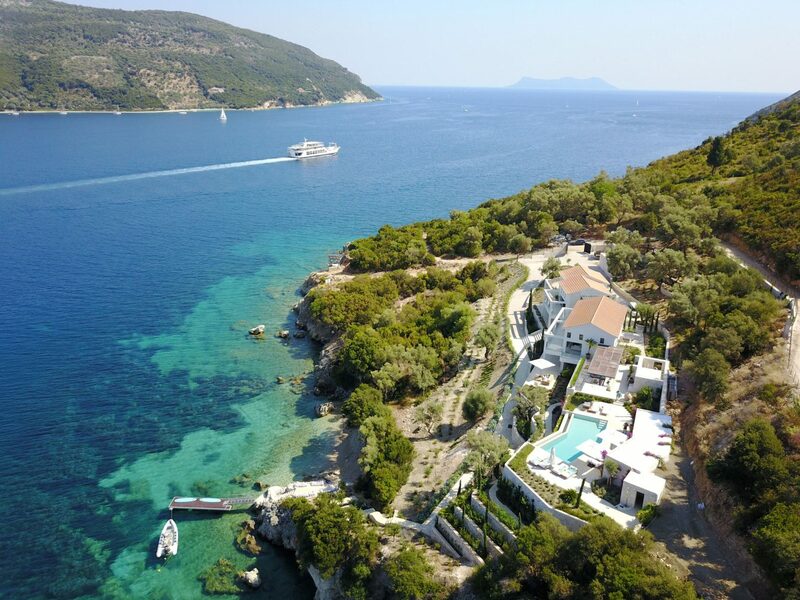 It is incredibly easy to visit both of these islands during your stay. 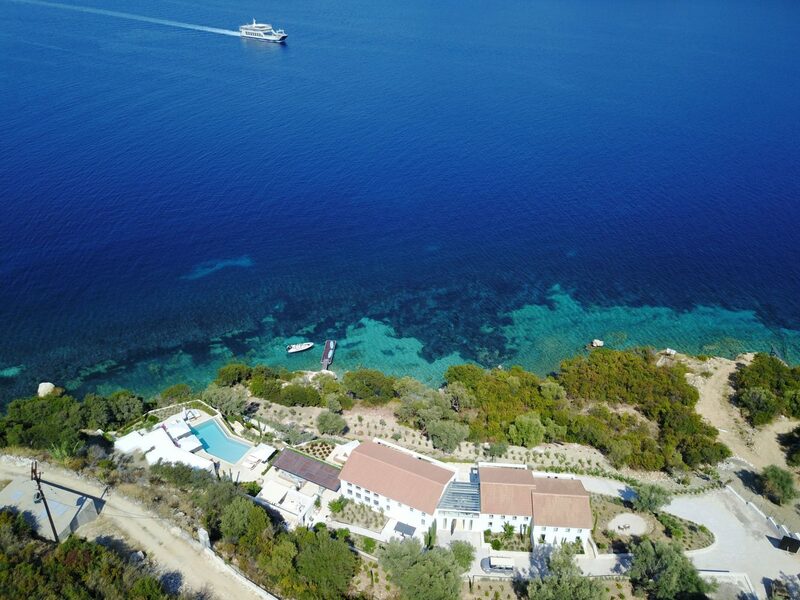 There are ferries, sea taxis or… take your own boat! 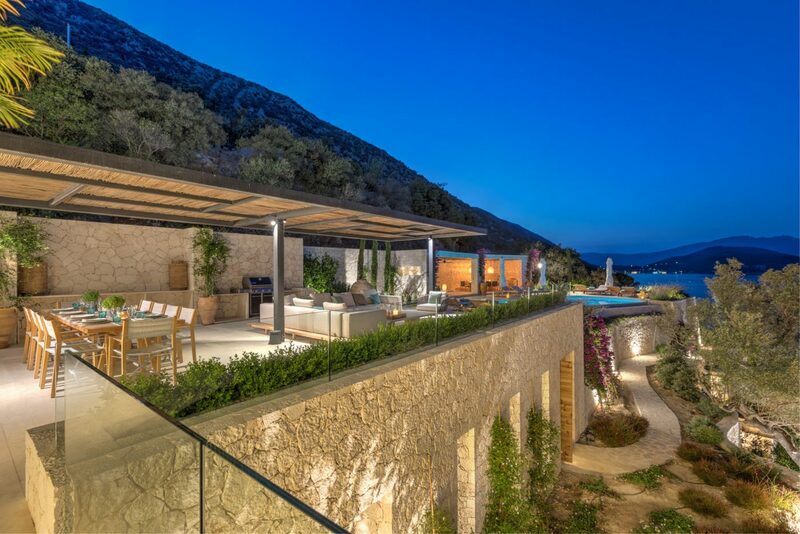 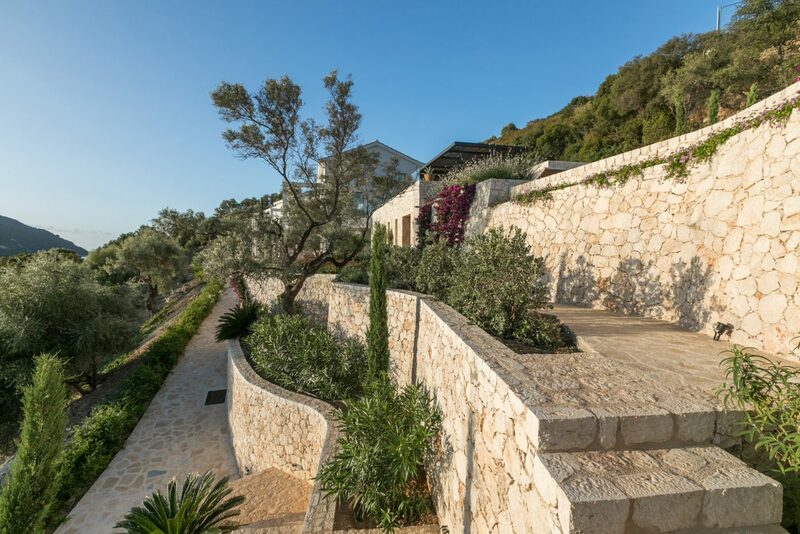 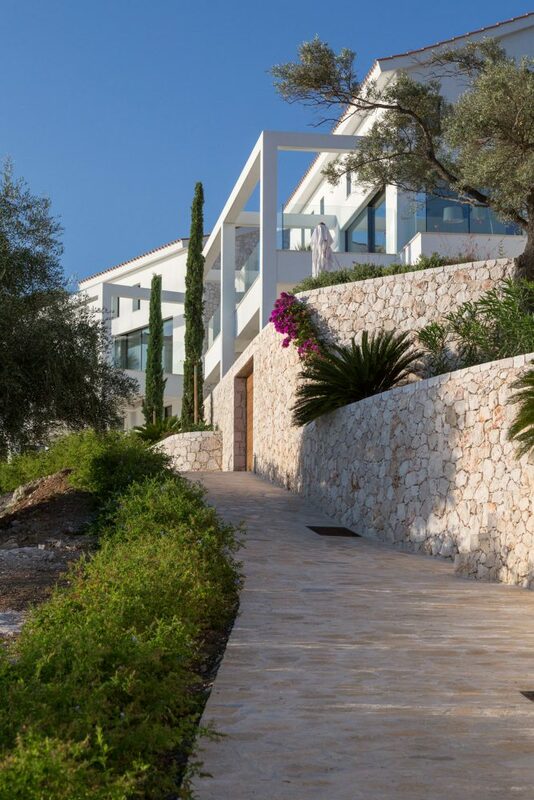 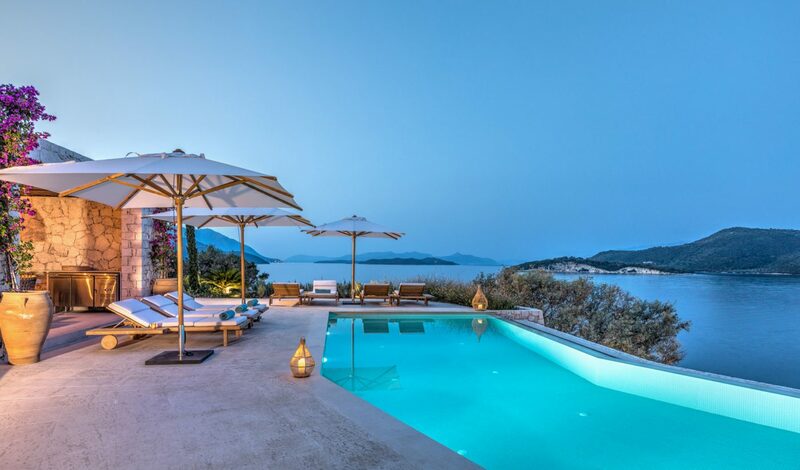 This is truly one of THE most spectacular sea front villas we’ve ever come across. 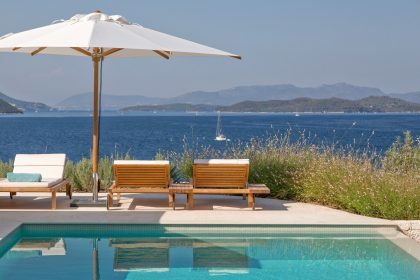 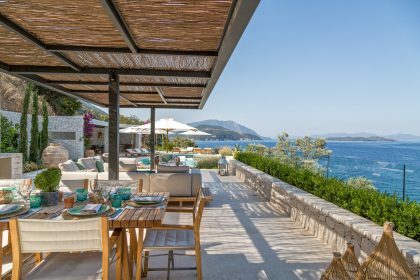 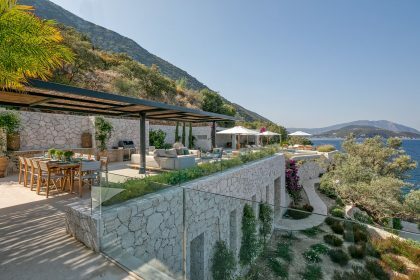 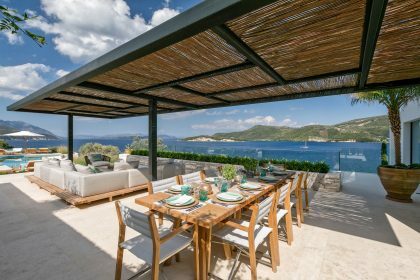 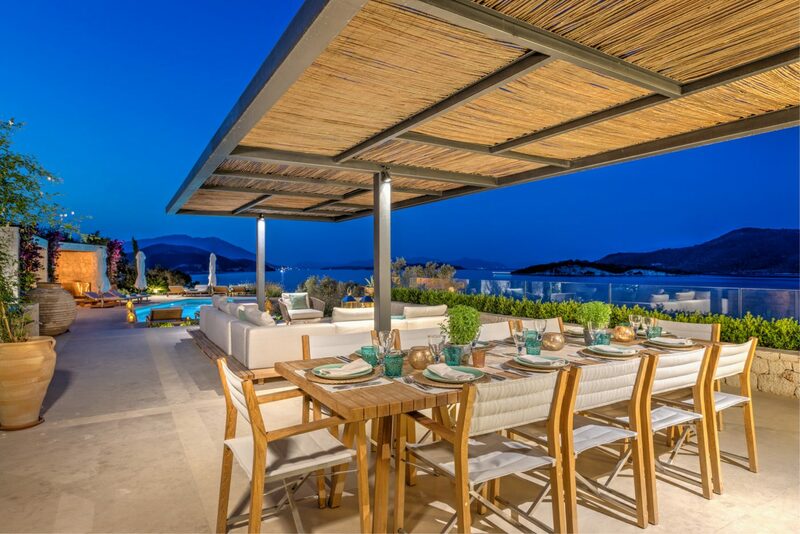 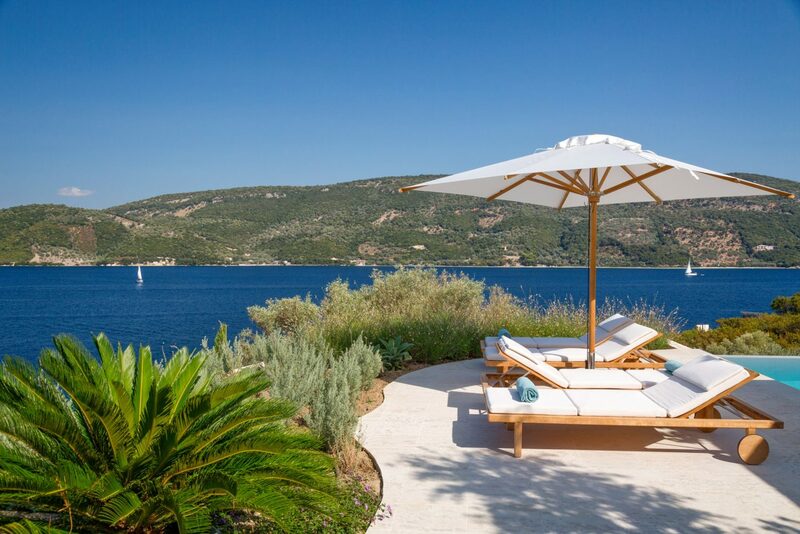 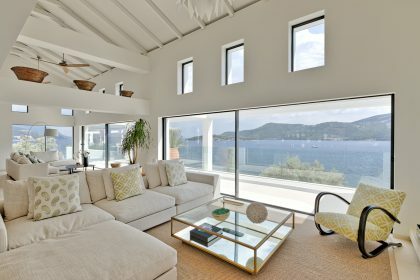 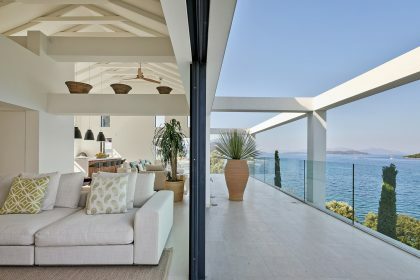 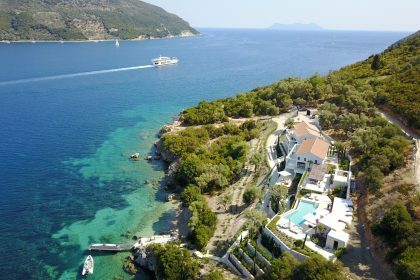 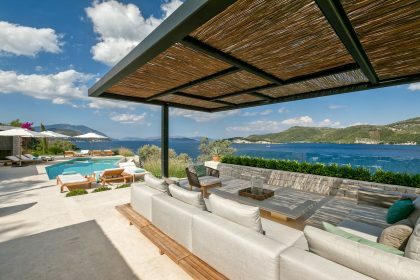 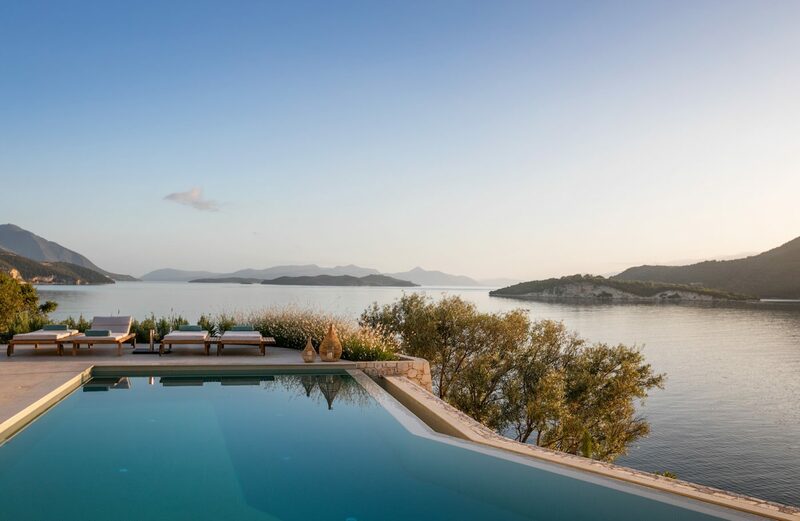 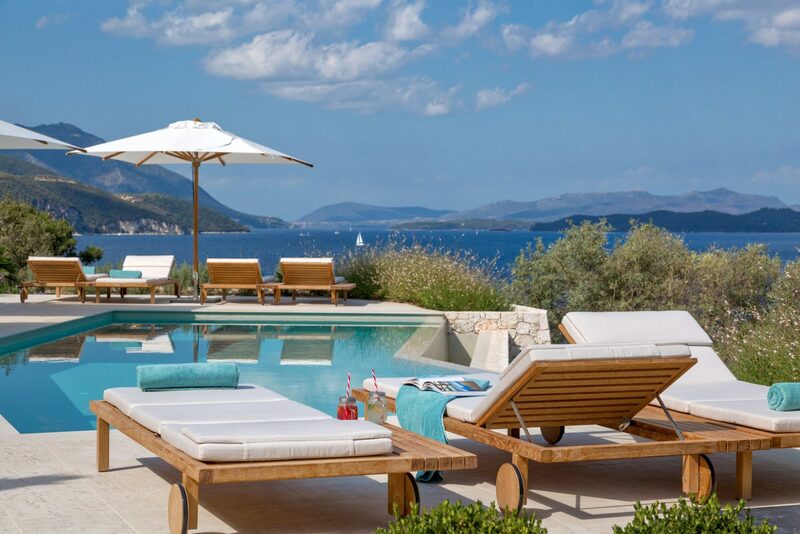 This glorious estate sits right on the sea overlooking the tiny island of Meganissi (it’s possible to get to Meganissi in minutes by RIB). 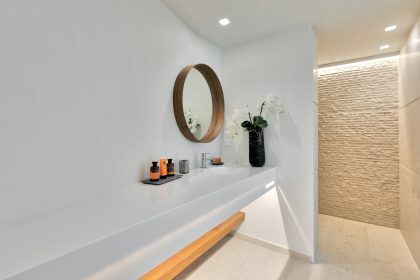 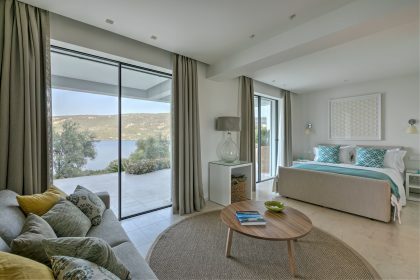 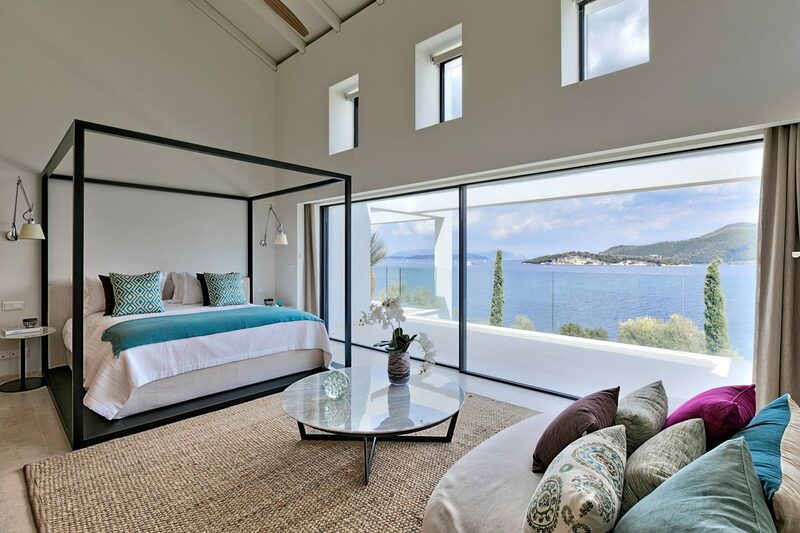 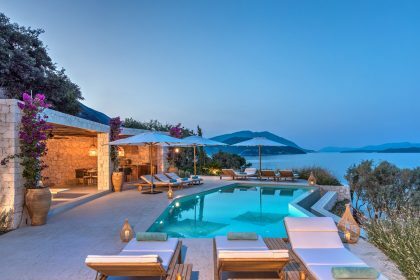 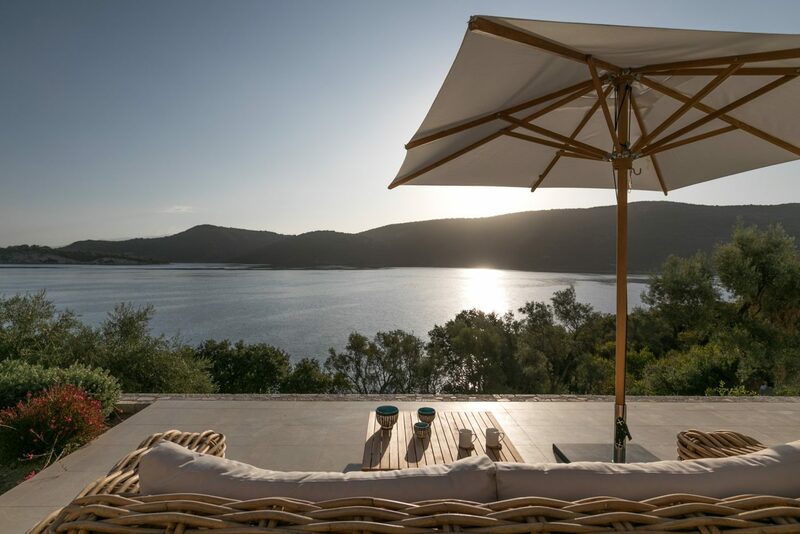 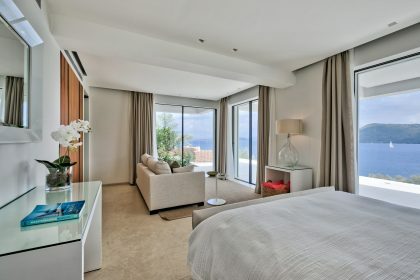 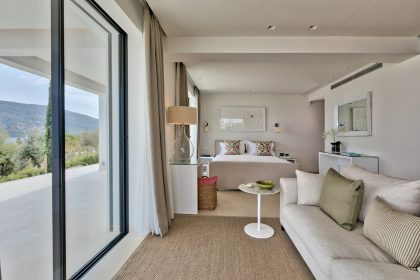 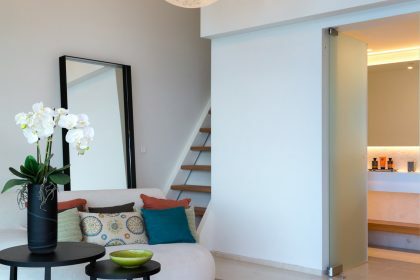 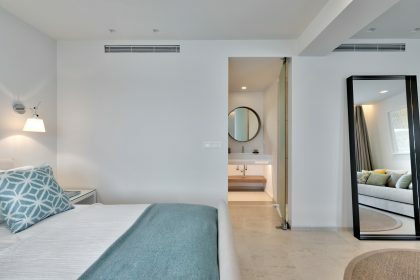 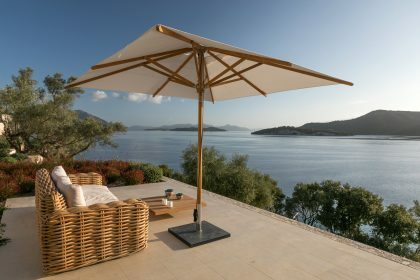 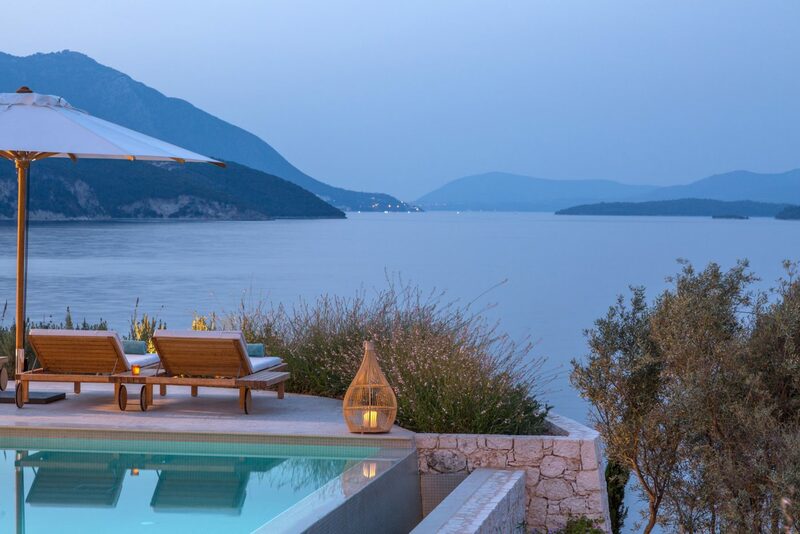 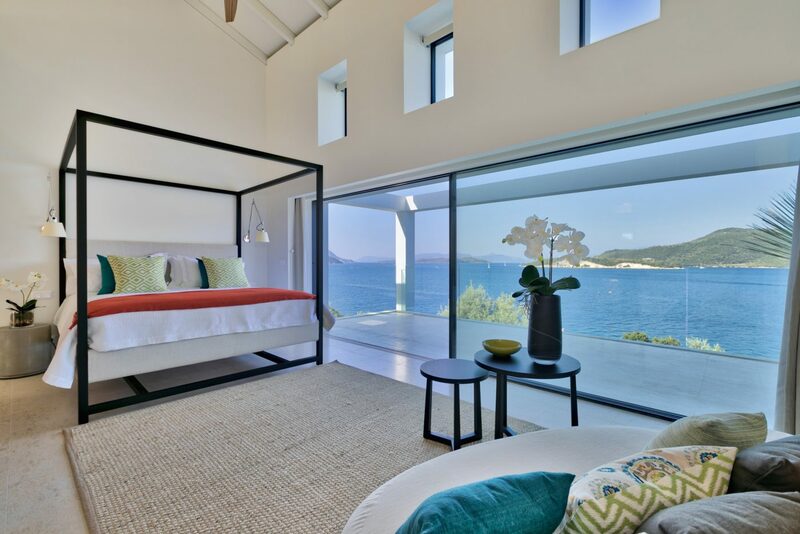 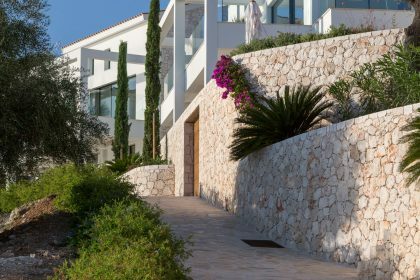 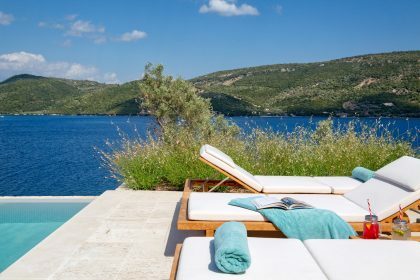 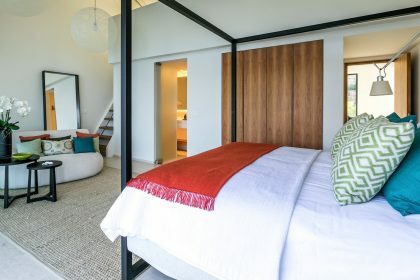 For those who haven’t been to Lefkada before this groovy pad would be the perfect introduction to this wonderful Greek island. 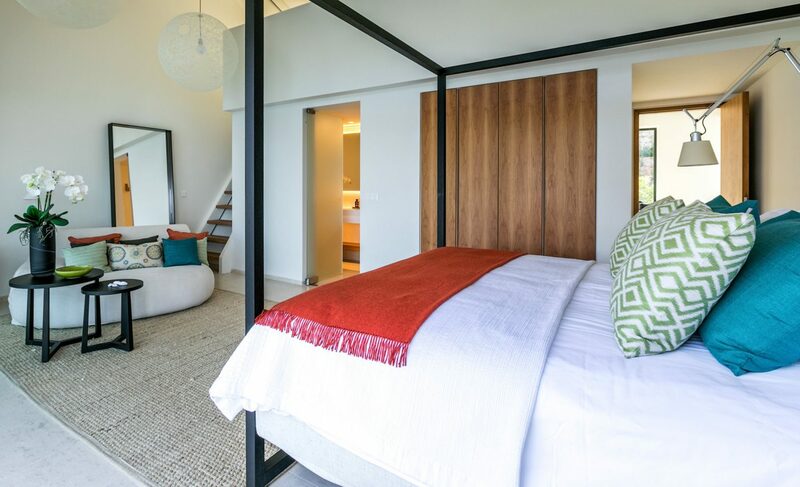 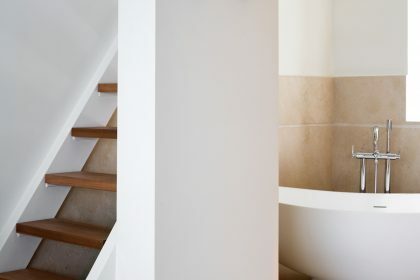 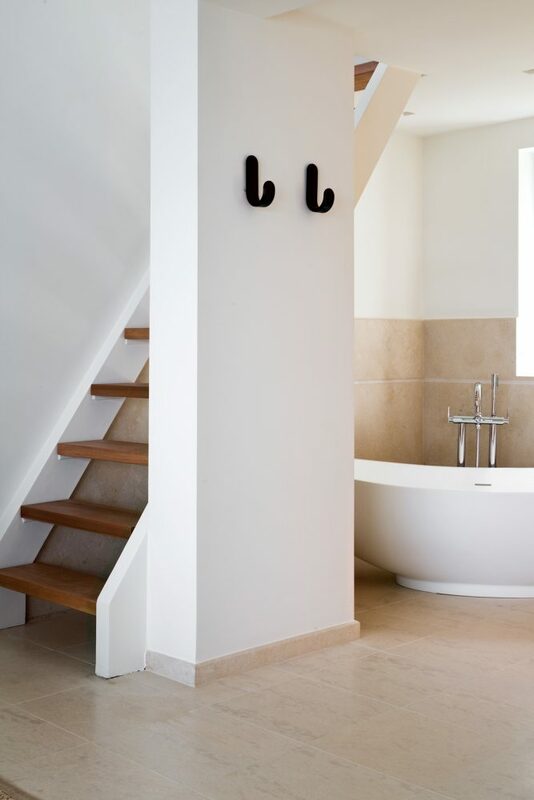 The house has been recently finished to the very highest of briefs, the owners have successfully developed another of our favourite houses (in Ithaca) and their style and skill continues here. 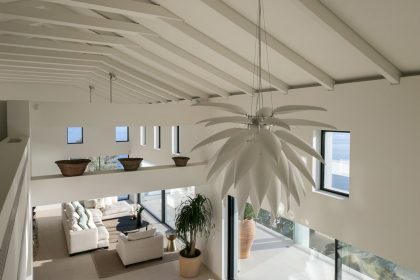 They really do know what they’re doing and their generosity knows no bounds. 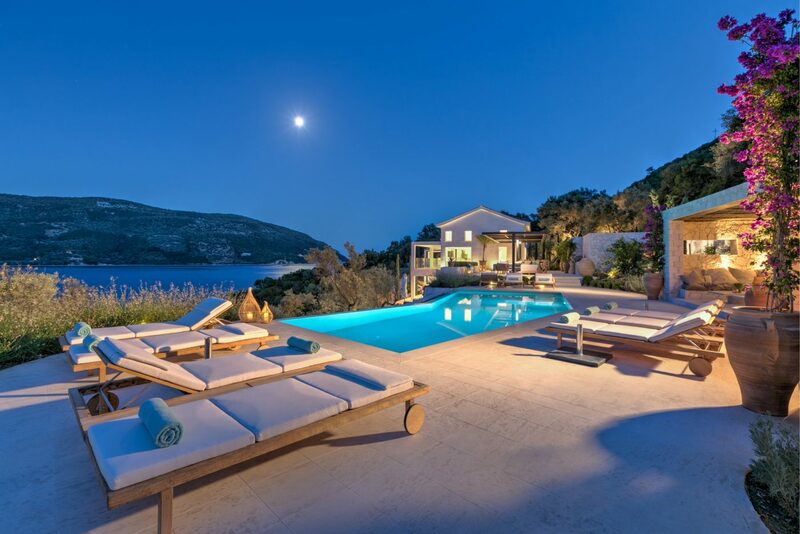 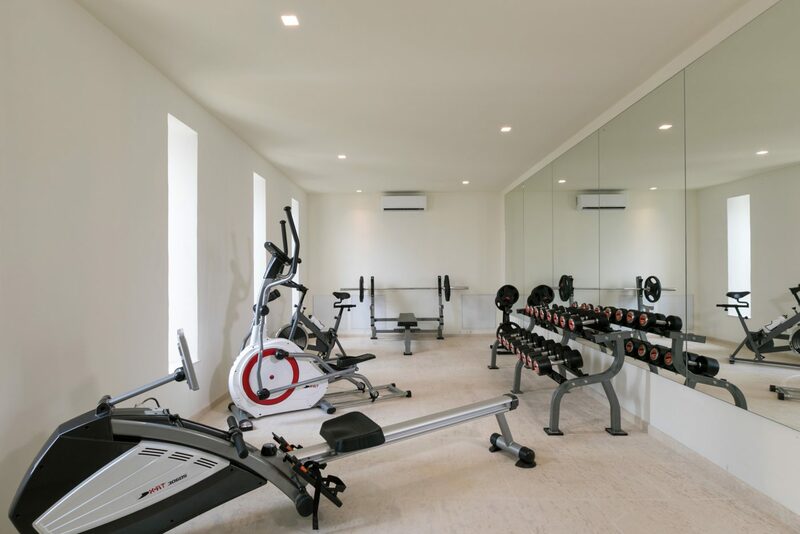 The house is luxurious and extremely well developed. 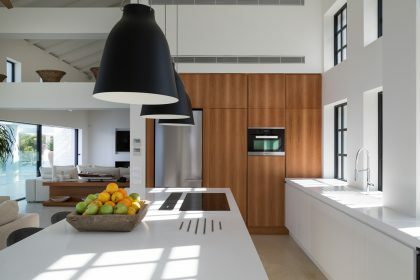 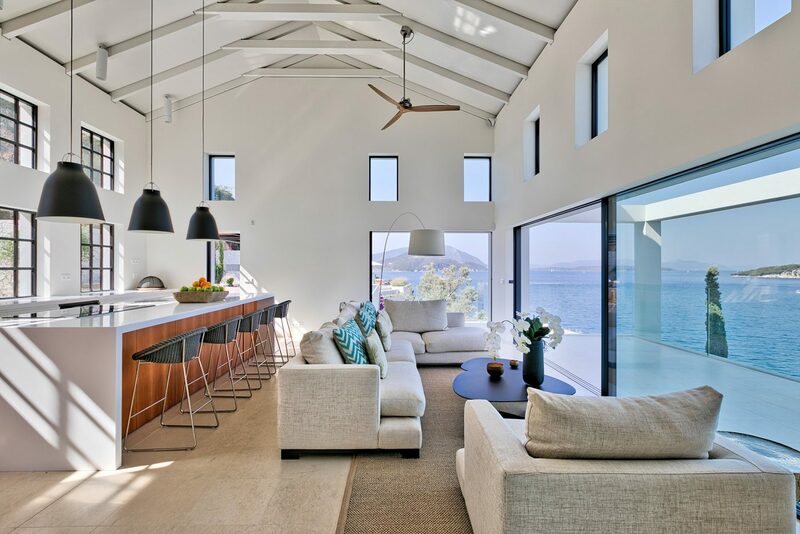 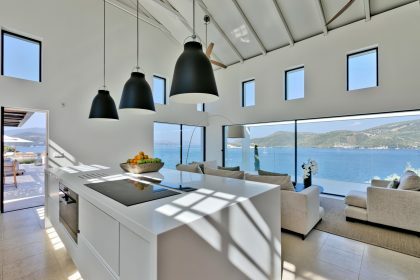 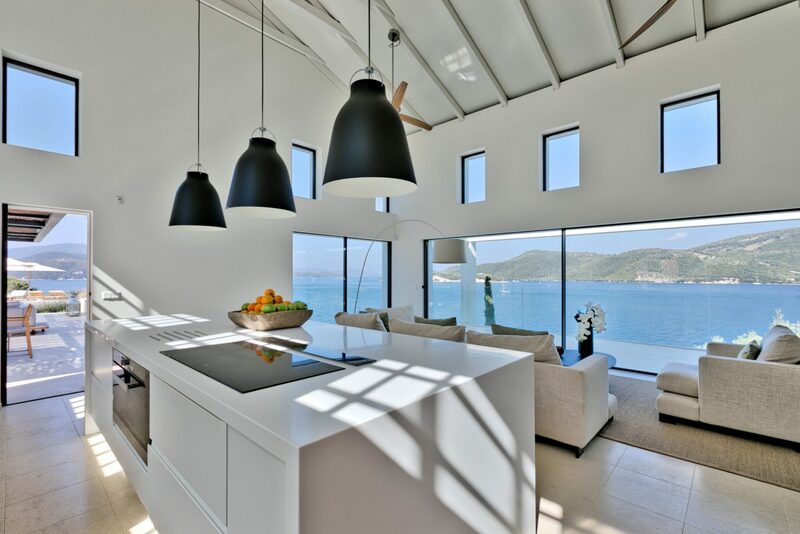 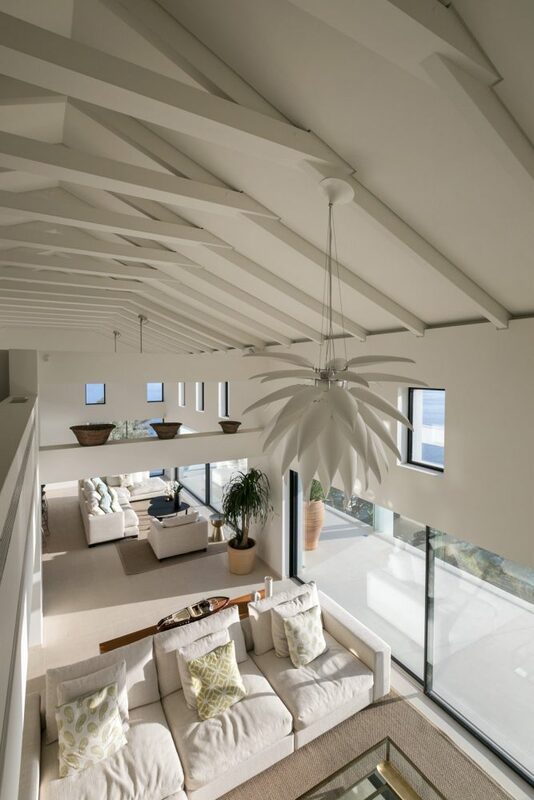 The huge open plan sitting room has a double height ceiling and glass doors looking out to sea (you’d be forgiven for thinking you’d landed in a slice of paradise here) – blues and whites abound through the whole house. A huge terrace runs the length of one side allowing guests to enjoy the indoor/outdoor aspect that contemporary villas are so known for. 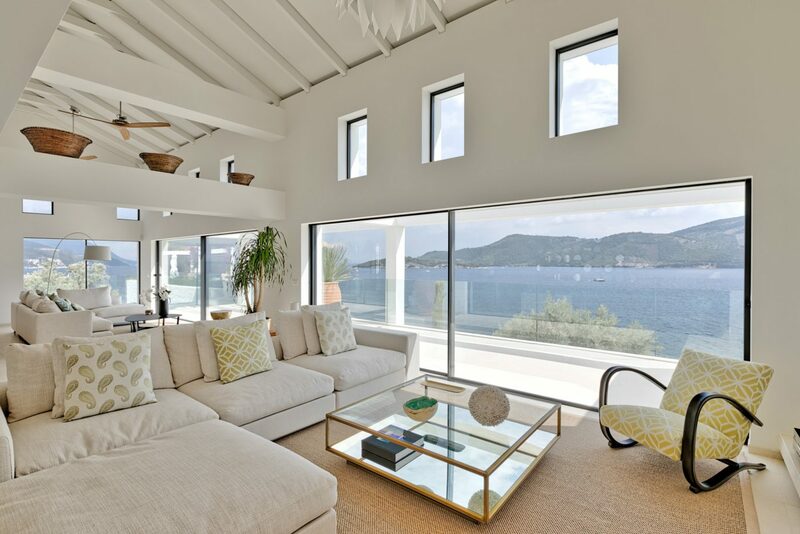 Floor to ceiling glass doors ensure the view is enjoyed from every aspect in the sitting room. 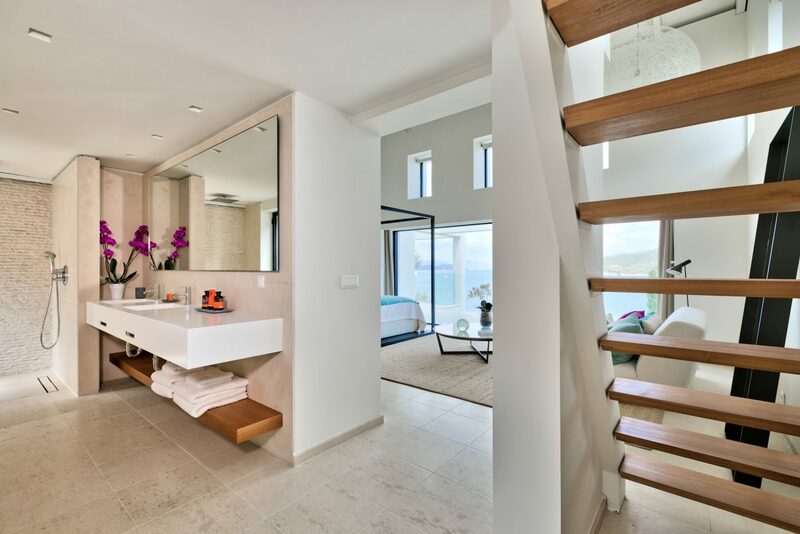 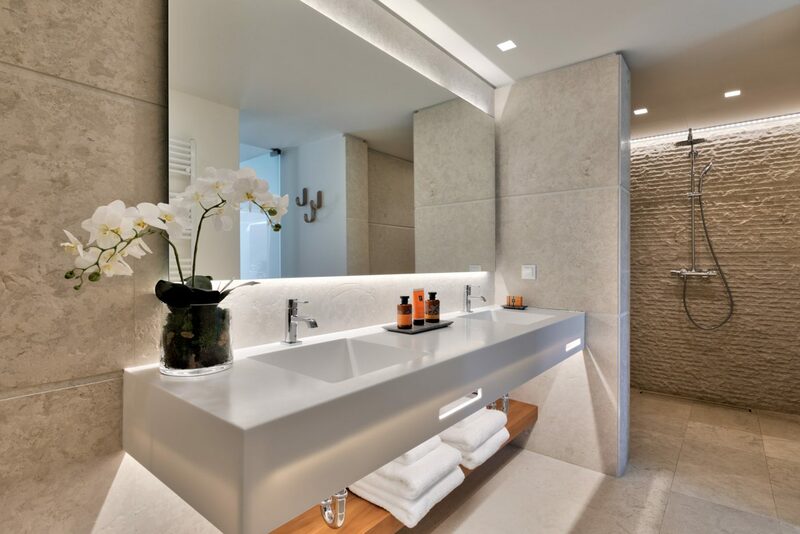 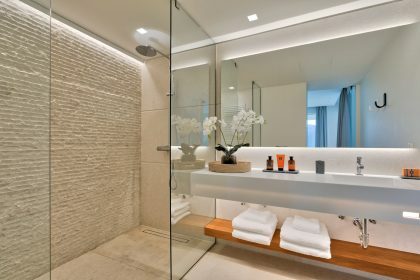 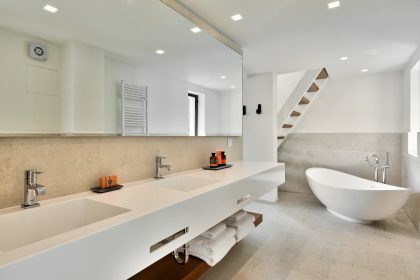 The bedrooms and bathrooms are big and modern. 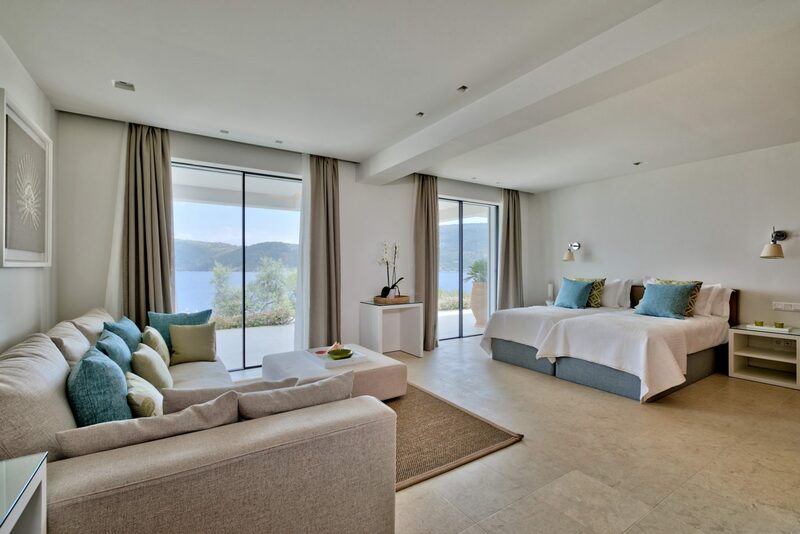 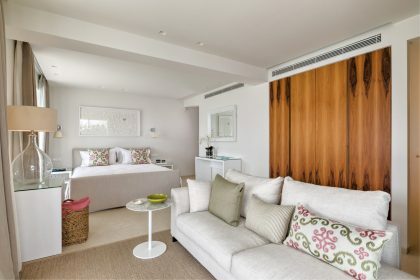 Each bedroom has its own terrace, there are beautiful glass lamps, lovely linens, fluffy towels and fabulous Korres bathroom products. 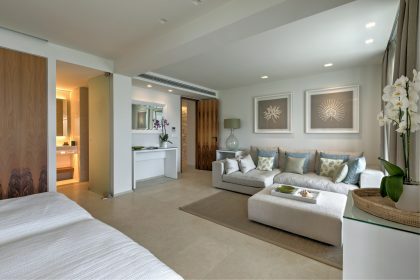 The bedrooms are uber comfy – with soft seating, just perfect for drinking in the amazing view. 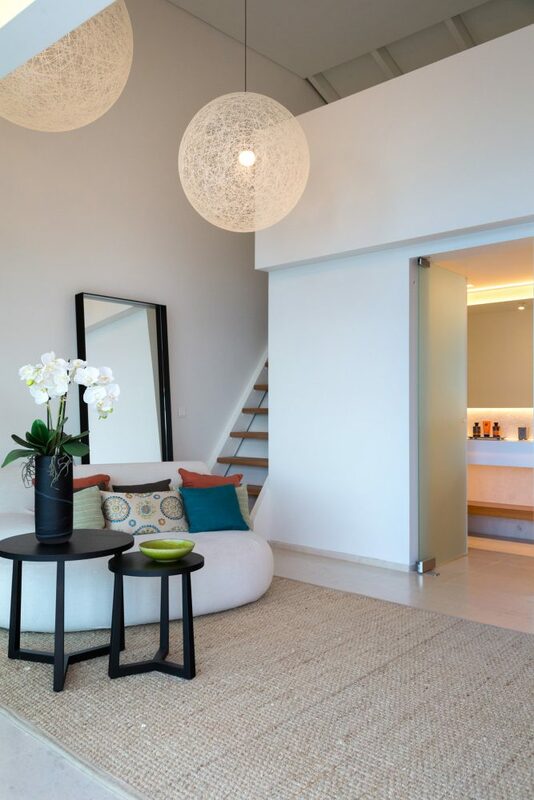 The finish is beautiful – in every way, floors are shiny, upholstery crisp and patterns clean-lined. Each room is unique but so well thought out. 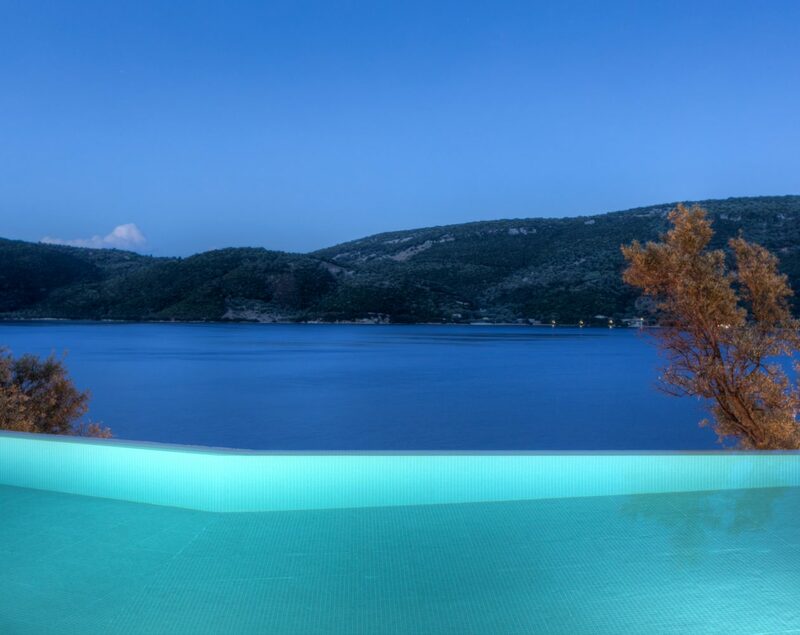 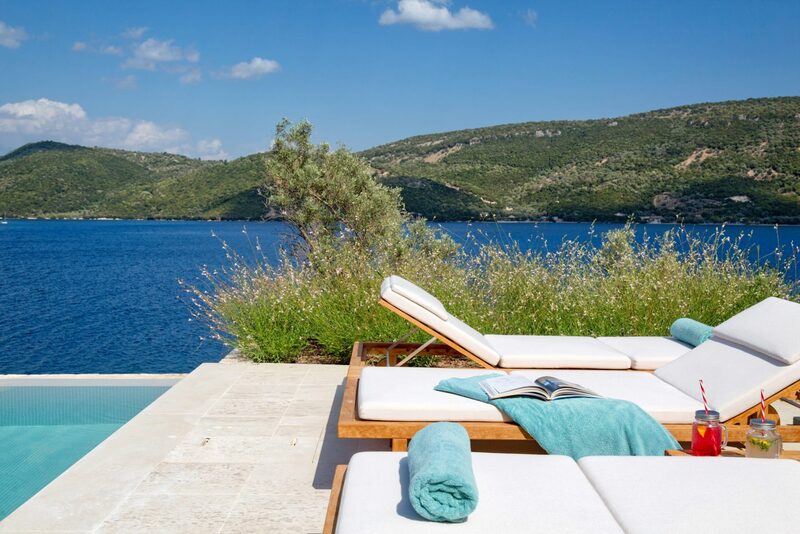 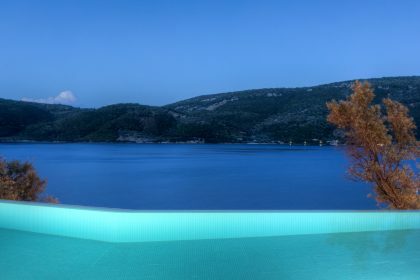 The infinity swimming pool clings to the edge of this glorious piece of coastline offering the very best view in the Ionian. If you can drag yourself away from the pool, wander down the path to the jetty where you’ll find the RIB (Rigid Inflatable Boat) which is yours to use while you’re a guest in the house. Or spend the day down at the seaside on the virtually private beach where the owners have created a decking area and put some beds so you can relax, soaking up the rays. 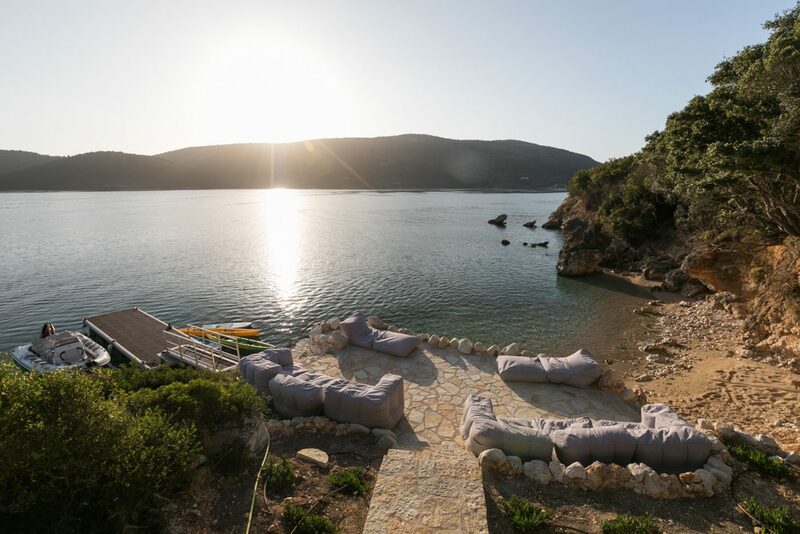 The live-in staff at the house will drive the boat for you, allowing your guests to use the houses’ waterskis and wakeboard – or enjoy their local knowledge as they take you to other islands to swim or snorkel before whisking you to a Robinson Crusoe beach taverna for lunch. 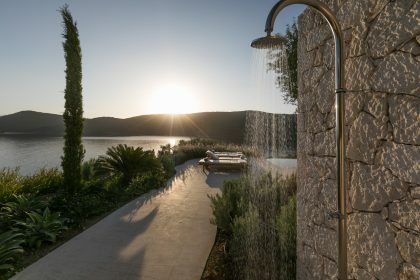 Come home to a hot shower before drinks on the terrace and the luxury of your own cook who will serve you a delicious dinner under the stars. 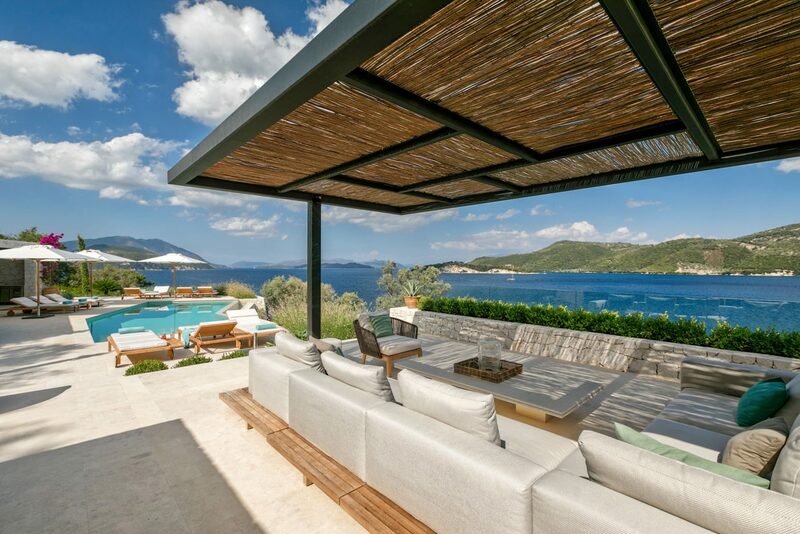 That view will keep you going through the winter months.